GE may be taking its time in launching designer electric vehicle charging stations, but Coulomb Technologies is already deploying free charge spots en masse. The startup, which is installing nearly 5,000 public and home charging stations across the U.S. as part of the $37 million ChargePoint America program, unveiled its first New York City station this week. Drivers will be able to juice up for free for the first 30 days at the station, located in an Edison Properties parking facility on Ninth Avenue between 35th and 36th Streets. But there’s a catch. Coulomb (or the city) apparently doesn’t trust the public to handle the station, so an Edison “valet” will make the actual connection from car to charger. 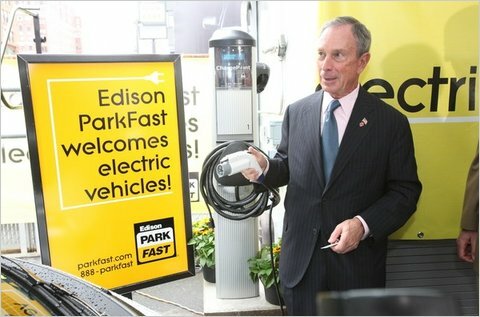 Eventually, Coulomb will install 100 residential and 100 public ChargePoint stations in the city in addition to 5,000 charging stations across nine states in the U.S. All of the stations will be free for public and private owners thanks to Coulomb’s $15 million in stimulus cash from the DOE. Coulomb has also partnered with automakers like Ford, GM, and Smart USA to offer its free in-home stations along with the purchase of qualifying EVs. Coulomb is taking a more utilitarian approach to its charge points than GE, which recently teamed up with designer Yves Behar to build a sleek yet-to-be-released EV charging station. Whether it makes sense to roll out stations as quickly as possible or wait until they’re a bit more attractive and user-friendly is still up for debate. But by the time GE’s WattStation is released in 2011, Coulomb will already have over 4,000 of its stations in homes and public places. That has to count for something.